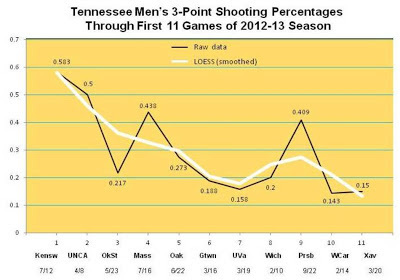 The Hot Hand in Sports: Tennessee Men's Three-Point Shooting Crashes! After catching parts of yesterday's Tennessee vs. Xavier men's basketball game -- one in which the Volunteers shot a dreadful 3-of-20 from behind the arc -- on television, I did a little research and discovered what can only be considered a collapse of Tennessee's outside game. 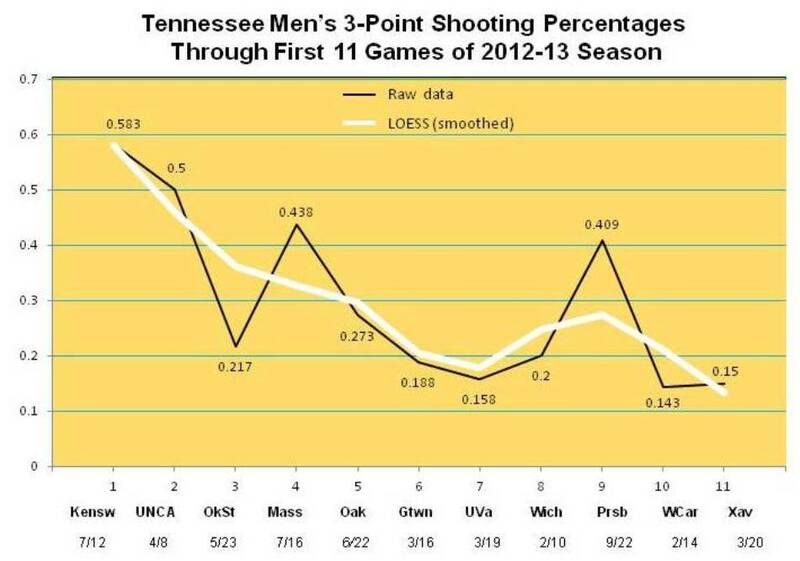 Below, I've plotted the Vols' three-point shooting percentages in each of their games thus far (game-by-game log). The original raw data are shown in the black curve, whereas a smoothed "Loess" curve that emphasizes the larger trend rather than short-term fluctuations, appears in white (see bottom of this post for an explanation of curve-smoothing). You may click on the following graph to enlarge it. As shown, Tennessee actually started out pretty well, exceeding .400 from three-point land in three of its first four games (against Kennesaw State, UNC-Asheville, and Massachusetts). From there, things went downhill, with the exception of the Vols' ninth game, against Presbyterian. Two games in particular in which Tennessee's offense entered the deep freeze were those against Georgetown and Virginia. In losing to Georgetown by a 37-36 score, the Vols not only had a bad outing on threes, but also struggled horribly on free throws (3-of-11). Then, against Virginia, Tennessee scored only 38 points, losing 46-38. At this point, the Volunteers have shot .200 or below from downtown in five of their last six games. As of this writing, Tennessee is tied for 317th out of 347 in the nation in three-point shooting percentage (.280, 51/182). In a situation like this, one might ask whether, perhaps, Tennessee had a good three-point shooter get injured after the first few games. That does not appear to be the case. In the opener vs. Kennesaw State, for example, guards Skylar McBee (4-of-7) and Jordan McRae (3-of-4) shot well from behind the arc. Both have played in all 11 of the Vols' games thus far this season.